A three-strong portfolio of SUVs has given German manufacturer Audi a strong foothold in a crowded market, all offering a desirable mix of premium luxury and versatility. But it is the smallest Q3 that is likely to be the most popular as it is the most affordable and is a more viable option for buyers keen to choose petrol rather than diesel power. 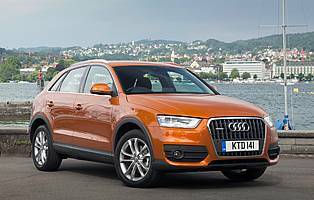 A cursory glance could mistake the Q3 for its bigger Q5 brother such is the similarity in exterior design. That's not necessarily a bad thing however as looks do play a big part in buying decisions in this sector. There are also clear elements of the A1 too, and this indicates the Q3's role in trying to tempt buyers who may have previously thought an SUV was too big or too intimidating to be a realistic purchase. The mechanical make-up of the Q3 also follows on from the bigger Q5 and encompasses the best Audi technology available. Although the diesel offering are likely to the most popular, a choice of two efficient petrol engines using Audi's TFSI technology make this a viable alternative, and buyers who are determined to stick with petrol can enjoy both performance and economy. All versions bar the high-economy diesel model come with the expected quattro four-wheel drive system, and transmission options are six-speed manual and a revised version of the seven-speed dual clutch S-tronic which will disengage the clutch when the driver lifts off the throttle to give a more efficient coasting mode. Choose the Drive Select system and an Efficiency mode is included designed to maximise fuel savings. 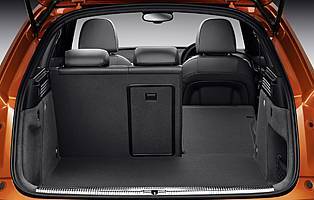 Inside the Q3 offers similar space to that of a conventional family hatchback, just with the added quality of a typical Audi cabin and the high seating position that is so desirable. It also can be specified with a huge range of high-tech kit usually reserved for models higher up the ladder; online connectivity to Google and in-vehicle WLAN hot spot are all available. The Q3 is a perfect example of the modern SUV, being big and sturdy enough to be practical and tackle minor off-road work but being comfortable and engaging to drive on-road. 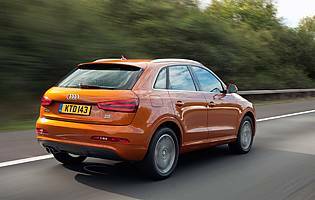 The high-power TFSI engine gives the Q3 real fizz and a keen driver will find its measured responses a strong performance a pleasure to use. That it does so while still offering respectable economy and emissions is a real bonus.